Ladies and Gentlemen, it’s safe to say Braxton has finally made a HUGE breakthrough in feeding!! After a very long 15 months, Braxton is eating again! AND he enjoys it! When Braxton was about 10 months old we started working on solid baby foods and he took to them right away. He was eating 4 ounces of pureed baby food 3 times a day and even drinking 6 ounce bottles. At 14 months old, he came down with pneumonia and was hospitalized for 5 days. After that, he began vomiting everything that we tried to feed him and he made a huge regression. He stopped eating completely. As he was vomiting so often, he quickly learned that anything that went in his mouth would make him feel bad, so the natural solution is to not let anything near your mouth. We have struggled for nearly 15 months for every single bite of food we could possibly get him to eat to overcome this severe oral aversion. We tried so many different strategies to make feeding fun and enjoyable, let him dictate the flow of things, and nothing seemed to help. We switched over to a homemade blended diet last December, and since then Braxton has completely turned around. He hasn’t vomited in a year now, so he is learning that it is safe to eat again without having anything bad happen. 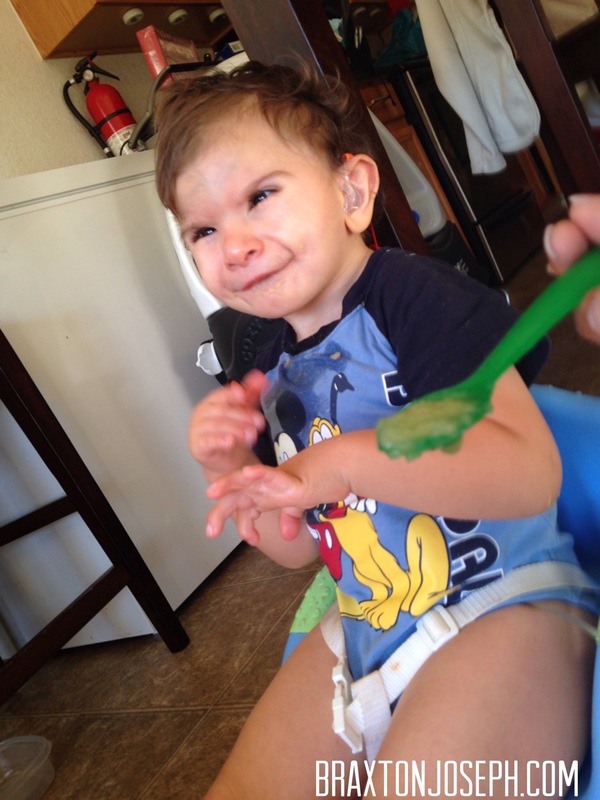 A few months ago, he started to eat in Speech Therapy with his therapist. Then, he started to eat for his teachers, but still he would not eat for us at home. I felt so defeated and like a failure. Mommy guilt hit hard when others were more successful at feeding my child than I was, but we kept working. Occasionally, he would eat about an ounce, maybe two ounces for me, but not much more. However, we finally have success! This is THE BEST eating Braxton has done for me!!! He ate 8 oz at school and just had another 4 at home. He was actively looking for the food, coming forward and opening his mouth! Yeaaaa Braxton!! Last week, our speech therapist called to say that Braxton ate TWO WHOLE pouches of pureed food that I had for him at daycare. That’s EIGHT ounces!!! When I brought him home, we tried again and he ate another 4 ounces! The next day at daycare, he ate SIX ounces! Over the weekend, he ate at least 4 ounces for me each day and with every feeding, he is getting so much better. He is finally actively opening his mouth, coming toward the spoon, and even searching for the food as if I’m not getting it to him fast enough! I am so overwhelmed with joy to see Braxton eating and actually enjoying it! We have waited so long and worked so hard for this moment. We are still a very long way from having Braxton’s feeding tube removed, but he is making steady progress. I can’t tell you how frustrating it’s been along the way, to see him make progress only to be setback over and over again. We are hopeful this time that we will continue to move forward. He is still eating mostly pureed foods, but as his success continues, we will move toward more textured foods and then hopefully more table foods. We offer him lots of finger foods, dry cereal, cookies, biter biscuits, and things like that, but he still isn’t quite as successful getting those to his mouth and IN his mouth. He will just hit them against his chin and then throw it down. Right now, I’m just happy he is eating anything at all. We are so excited! Yea, Braxton! Wow, this is so very exciting, congratulations! I hope he keeps it up and continues to improve! I have a three year old tubie with severe oral aversion due to serious GI issues. I found your blog months ago via the FTA page. Thank you! We are hopeful he will stick with it this time. Praise God in heaven! I am so happy for Braxton and the family! My mother and I will continue praying for more success. I see this news as an early Christmas gift. Please give Braxton a huge hug and kiss for me. Merry Christmas! I know. Every victory you share, my family and I rejoice. Braxton’s breakthroughs are signs that love, faith and pint-size tenacity go a long way. Merry Christmas to you all!